Plaka bridge is a one-arch stone-made bridge situated in the Epirus region, Greece, that collapsed in 2015 due to heavy rainfall and floods. Because of the significance of the bridge a restoration project was initiated by the National Technical University of Athens by forming an interdisciplinary team of scientists and is still ongoing. The article aims to present part of the work of the research team of our School of Electrical and Computer Engineering of the NTUA in the restoration project. The main contribution of the research team (Information Systems with application to Archaeometry, Sound and Video Processing and Arts Laboratory) of our School in connection with the Plaka bridge is the virtual representation of the bridge before its collapse in 2015. In fact, provided that a sufficient number of stones/structural parts of the bridge will be found, then in close collaboration with the School of Rural and Surveying Engineering and the School of Architecture of the National Technical University of Athens, 3D representations of these parts will be captured via a proper scanner. Subsequently, our research team will apply a set of methods conceived and developed by its members, so as to virtually reassemble the individual stones/structural parts. These reconstruction methods have been first applied to the field of Archaeometry, as briefly described below. 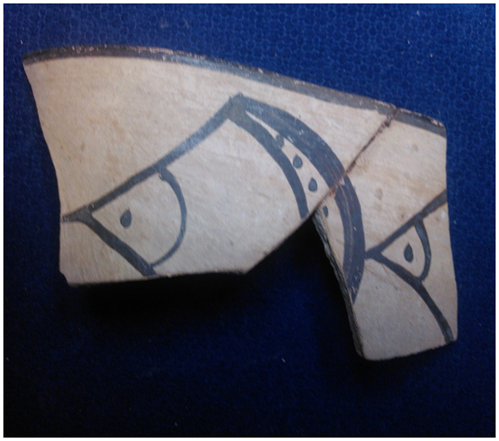 Indeed, as a rule, Archaeological finds are unearthed fragmented, in many cases in numerous fragments. This is true for the celebrated finds of Akrotiri Thera, Mycenae, Tiryns, Thebes, as well as in most places in Greece, Egypt, Italy etc. The reassembly of the fragments in order to restore the initial object is a very painstaking and time-consuming process, frequently demanding many months or even years of dedicated, experienced personnel work for a single object restoration. 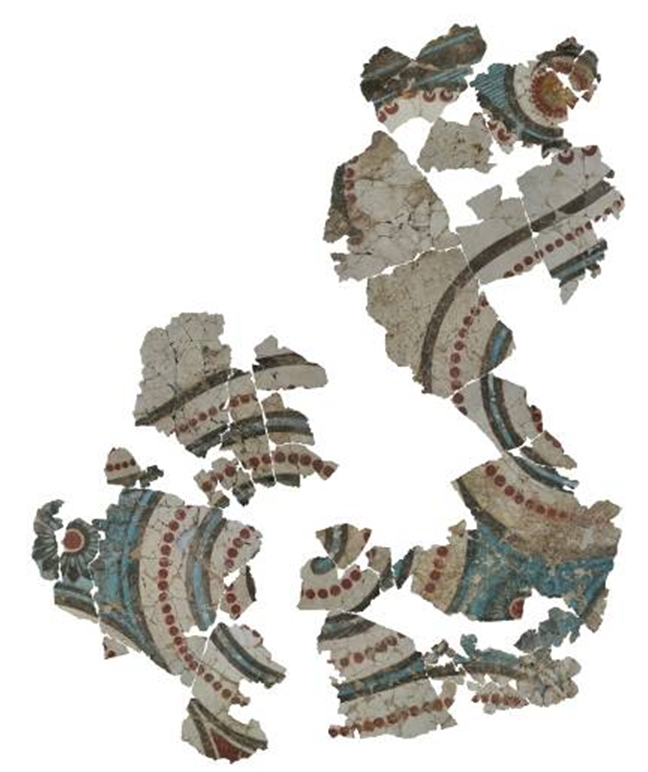 Parts of frescos excavated at Akrotiri, Thera in hundreds or even thousands of fragments. Parts of prehistoric wall paintings unearthed in Tiryns and Mycenae, the excavation of which was first supervised by Heinrich Schliemann. The developed methodologies explore i) the 2D matching of the Archaeological finds main surfaces, ii) the 3D geometric matching of the constituent parts and iii) the eventual thematic and color continuation of the various fragments. Examples of successful application of the aforementioned methods are shown below. 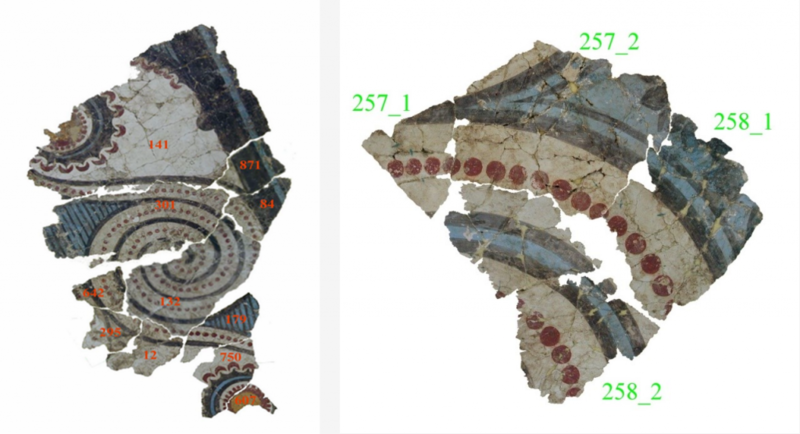 Images of wall painting fragments excavated at Akrotiri (Thera). Examples of Akrotiri (Thera) wall painting parts automatically reconstructed by the 2D methodology, for the first time. 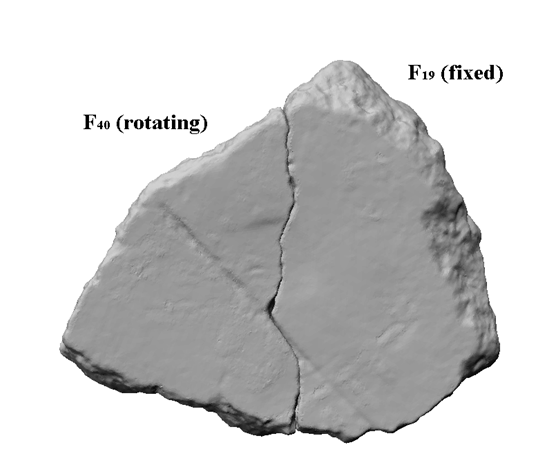 Examples of 3D representation of fragments obtained by our research group via 3D scanner. Two optimally matched fragments in 3 dimensions; the matching position has been automatically suggested by the system. Images of reassembled islands suggested by the developed system; the fragments have been excavated at Tyrins.